There's an amazing view out there somewhere! Every time I get out my backpacking gear and make too-ambitious plans for a weekend outside, Mother Nature knows. And just to be sure I'm on my game, she'll throw everything she can at me to see if I'm capable of enjoying myself while being soaked and fearful of being struck by lightening. After re-examining this past weekend's trip to the Catskills, I'm a little disappointed in how I handled some of our challenges, but overall, I learned valuable lessons about how to manage my attitude that'll come in handy. This was my second trip to Devil's Path, the first being June of last year. My partner in crime and I came up with a different plan this year, focused on gaining elevation with heavy packs, just because we like punishment! The plan was to spend all of Saturday hiking the eastern portion of Devil's Path from west to east, and get as far as we could before setting up camp, hopefully summitting Indian Head (3,573'), Twin (3,640'), and Sugarloaf (3,500'). The summit elevations can be deceiving - one look at the map, and it's obvious there's a significant amount of elevation to be gained en route to each peak, then lost prior to climbing up to the next. Hence the trail's well-deserved name! If nothing else, the rain makes the woods so green! We left Philadelphia early Saturday morning. 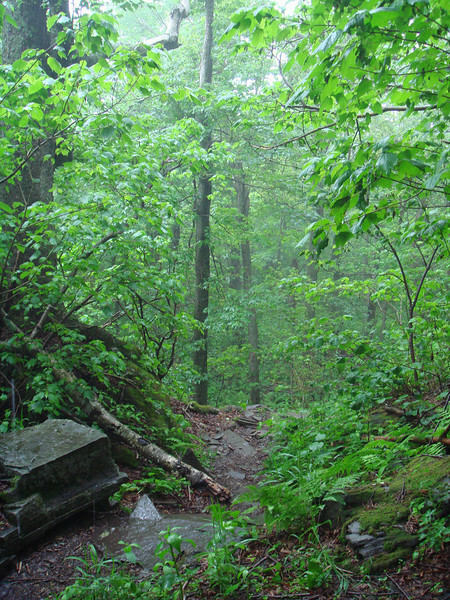 The weather called for a 40% chance of rain and thunderstorms both days we planned to hike, and as soon as we stepped out of the car at the Prediger Road trail head, it started to pour. I was slightly disheartened, but not surprised. We put on all of our rain gear and left the parking lot just after 10am. 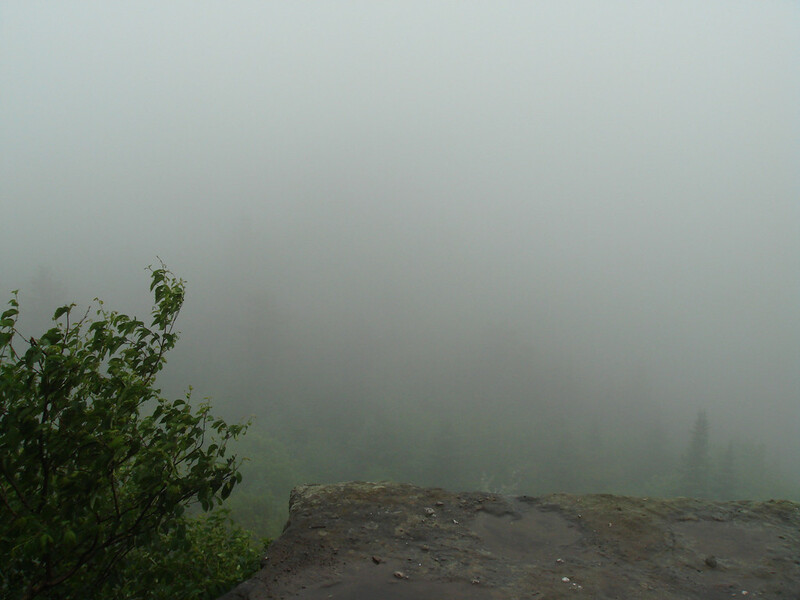 The air was completely saturated with moisture, and it appeared we were ascending through a cloud. Just before summitting Indian Head, we found a small overhanging cliff to have lunch under and get out of the rain. At this point, I'd gotten myself into a bit of a funk over the weather, how slippery the trail was, and was trying my best to snap out of it. 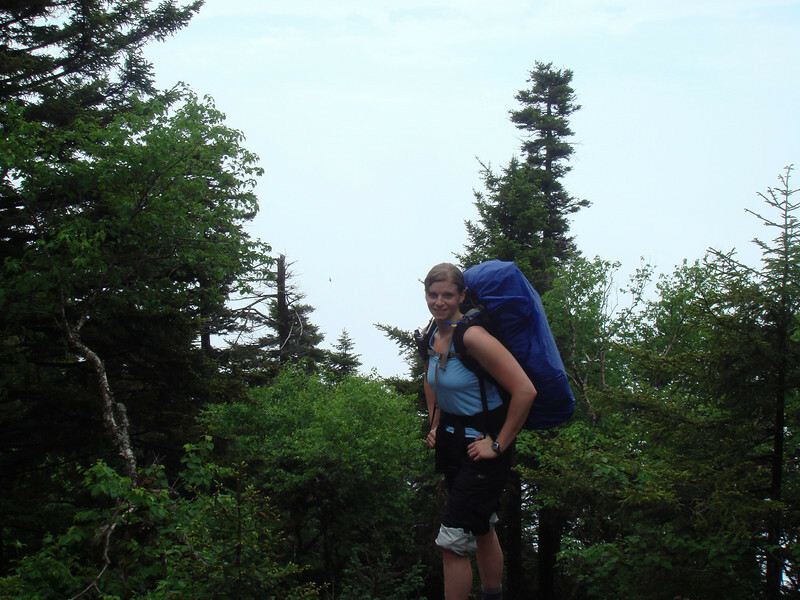 We summitted Indian Head just after 1pm, and pressed on to Jimmy Dolan Notch mid-afternoon. There, we decided to set up camp at a site we'd been to before. It's a bit off the beaten path, and it was just as amazing as we remembered! I was a bit contrite about cutting out the rest of the hike, but it worked out just fine. My partner in crime making his silly, "look, I made a fire with soaking wet wood!" face. We set up camp and Dan got to work trying to get a fire going, just to see if it was possible. The rain had momentarily stopped, but we were still in a cloud. We collected birch bark from a dead standing tree and crushed it up, hoping it would ignite. I lost count of the number of matches it took, but with an incredible amount of effort and attention, Dan got it lit and we kept it going all afternoon. By dinnertime, we'd built it up enough to shift our attention to cooking - a feat I'm still marveling at. 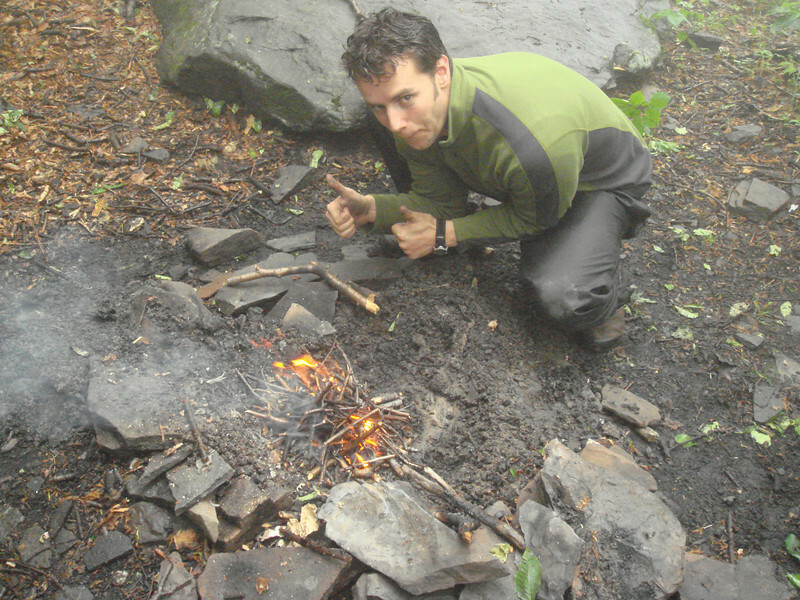 Being able to start a fire when all the wood around you is soaked is difficult, but as we proved, not impossible! Small victories! Our tarp made water collection a cinch. Another challenge on Devil's Path is the availability of water. Streams are scarce, even when it's raining, which we handled on the 2009 trip by finding a small trickle of water and creating a puddle to pump water from. This time, the trickle wasn't there, even with all the rain. As we finished dinner, it started pouring again. I got one of my Nalgene bottles out and used it to collect rainwater from the tarp we'd hung over the tent. It was full in a matter of seconds and we pump filtered it into another reservoir. As the downpour abated, we had three liters of water collected. I felt a little sense of accomplishment, having made the best out of the rain and using it to our advantage. After stashing our bear canister (a MUST if you're backcountry camping in the Catskills, Adirondacks, etc. ), we settled in for the night. 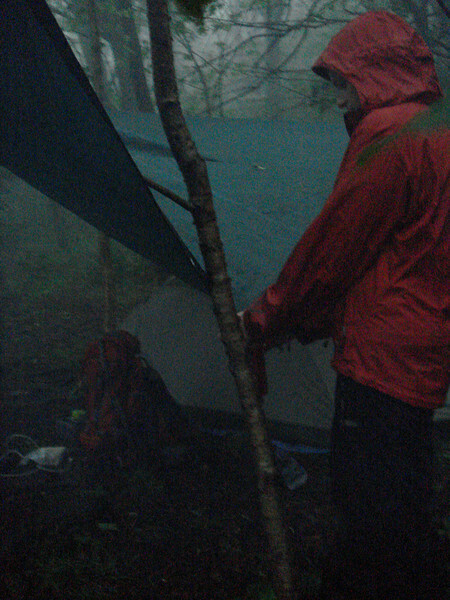 The rain continued to fall on and off, and I woke up around midnight to a loud crack of thunder in the distance. Wide-eyed, I watched flashes of lightening illuminate the tent at regular intervals. Thousands of years of evolution have programmed my brain, and all the little hairs on my arms, to be wary of being outdoors during a thunderstorm. Despite the fact that the storm sounded far off, the pounding rain and lightening flashes combined with that half-lucid dream-sleep state you're in when something wakes you in the middle of the night, I was scared. But we weren't up very high, we were in a thick grove of trees, and there were many things taller around us. The storm stayed at a distance, and we woke up the next morning to more fog, but no rain. On top of Indian Head on the hike out. The rain stopped, but alas, no views. The hike out was both quick and enjoyable. The best part was discussing what we planned to order from Pancho Villa's Mexican Restaurant in Tannersville, NY. A stomach full of cheese and salsa is the best way to end a hike! Activities like backpacking, mountaineering, etc. will, more often than not, force you to be outside when the weather's dreadful and all you want to do is give up and go home. But it's how we approach those situations that makes us stronger, and better equipped to handle the next challenge. This time, I didn't do too well; I let a lot of the little things get me down. But I did find that tackling projects, like collecting water and keeping the fire going, were wonderful distractions. And I'll take this experience and use it to help me adjust my attitude next time. What are some things you do to help snap yourself out of funks when things get rough? Absolutely amazing - the photos remind me a bit of my own Pacific Northwest. I'm a bit of a snobbish city girl, so camping still kind of freaks me out (yes, I'm serious). 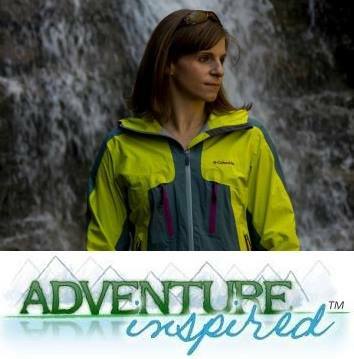 I've found that having a blog really helps me be more adventurous and positive about all my travels, though - because even the mishaps make great stories!